A catalog, journal, and guide all in one, A Record of My Vinyl is the ultimate autobiographical companion to your analog collection. I do not make an effort to hide my love for notebooks or records. So a notebook dedicated to keeping track and caring for vinyl records? Yes please! I was so excited to see this option presented on the Blogging for Books site, and requested it immediately. When I received it in the mail, I squealed with delight – the journal is truly stunning with a lovely cover showcasing a vinyl record. I am new to the Vinyl world, but am quickly falling in love. So while I am not perhaps the “hard-core” vinyl collectors out there that some of the info in the notebook hinted at, I am vastly enjoying it, and cannot wait to transcribe my own personal collection of records into this journal. The style is easy to use, clearly presented, and the information in the back quite helpful. Definitely a gem for any Vinyl enthusiast – new or old! Surprisingly to me, I am enjoying this Amish series. Personally I am not a huge fan of Amish fiction, but the first two books of this newer series have been interesting reads that keep me occupied. I enjoy the characters, and the plots have been sweet. 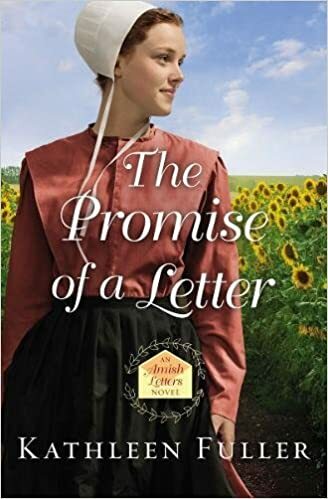 In “The Promise of a Letter”, we get to see more of Leanna’s character that was introduced in the first book. I really liked Leanna – she was a very spunky, fun character. And Roman was an equally good character in different ways. I appreciated the faith aspect, and Roman’s grandmother’s influence even though she wasn’t present in the novel. The sibling dynamics between brothers Roman and Daniel was realistic in their struggle for reconciliation – and stubbornness against it happening. It was frustrating at times, but not unbelievable, which I think is good. I don’t know how accurate to the Amish way these books are – some things in the books seem a little far-fetched, but I guess I really can’t say one way or another. The cover is lovely, and the story, too. What kind of threw me off, to be honest, was the switching back from one time period to the next with each chapter – I found myself having a hard time switching gears, getting into one character’s story and then having to switch to the other, etc. I must confess that I “cheated” and just read the story of Liberty’s first, switching off about halfway through to catch up on Anaya’s, and then slowly eased my way into reading it “normally” towards the end where it made most sense to do so. By reading it in this unconventional way, I was able to enjoy it more, personally. Liberty’s story was a little heart-rending, the struggles and pain she had to go through. She had a hard life. I felt for Annie (Anaya), and her own trials she had to deal with. Really, both of these characters dealt with struggles and trials that shaped their lives. They were not free from pain, but they learned to live through it and eventually, find God’s Grace, Mercy, and Salvation. But yes, it was a good book, one I’m sure many will enjoy. I absolutely loved Katie Davis’ first book, “Kisses from Katie”, and so when I saw that she was writing a new book, I was beyond thrilled! And then even MORE beyond thrilled when the opportunity came to review it. Yes please! I do not read a lot of non-fiction. But Katie’s two books have captivated me fully. I have loved them both. “Daring to Hope” was so inspiring, so encouraging, and so challenging. I was just deeply moved. Each new chapter had me thinking more, and I shed many a tear from my heart being touched by her words. A truly magnificent book. She just writes with so much passion, and it is all so God-centered. Really, I’m not sure I’ve read a book so full of God’s glory being the focus as this book was. Every thought was turned back towards Christ. What a lovely accomplishment! He is worthy to be praised, and that was shown well in “Daring to Hope”. This book isn’t just a light, inspiring book – it is prick-your-heart and make-you-want-to-grow-more. So much so. Katie D. Major’s tackles the hard aspect of faith: Do we trust Him even when it’s hard? When He does something different to what we prayed for? Wow. Her life-experiences lends so much to these lessons. Reading this, I just was encouraged to really pray even more and trust even more. He is Worthy. He is in Control. And He does all things for our good – even the hard things. I so definitely recommend this book – it is a must read! I also loooved reading about how her marriage came about. Wow, what a cool God-story. <3 That really encouraged me too. I could probably just go on and on about this book – I am just full of love for it! But I suppose I shall end with one last word: Exceptional! About the Book: When Signe, her husband, Rune, and their three boys arrive in Minnesota from Norway to help a relative clear his land of lumber, they dream of owning their own farm and building a life in the New World. But Uncle Einar and Aunt Gird are hard, demanding people, and Signe and her family soon find themselves worked nearly to the bone in order to repay the cost of their voyage. At this rate, they will never have land or a life of their own. This was actually my first book that I’ve read by Lauraine Snelling. The setting was what really drew me in – I love all things Norwegian, and living in MN myself, it seemed quite perfect for me! :) And indeed, I enjoyed the setting very much. The names! They were probably my favourite thing about the book – I just loved them. So…Norwegian, and much like the viking names I love. “Signe, Rune, Bjorn, Knute, Leif…” etc. Just brilliant. The beginning of the book was a bit hard for me to get into at first, but once I reached about the middle of it, it picked up and really held my attention. Some parts seemed repetitive, more like a filler, but otherwise it was a well written story.